Sarees are something that looks flattering on almost all Asian women. They have been in trend for over centuries. Still, the sheer simplicity of the attire in the hot weather of the subcontinent makes practical sense. Pakistani women might not wear them on a regular basis, as it was more preferred by women of East Pakistan, now Bangladesh. In Pakistan, sarees are more formal and perfect for weddings. The modern saree silhouettes are more favorable to the tall, and slender framed women. However, you can reimagine these branded designer sarees for the wedding of a sibling, a beloved cousin, or a best friend. 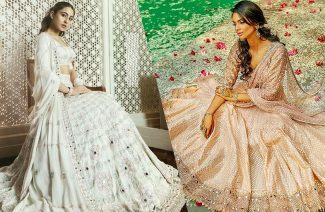 If you are a new bride, you can rock these sarees on the wedding hosted by your in-laws to rock the perfect bahu look. This silver sari with cutwork blouse is the definition of simple elegance. The silk used in the saree is pure charmeuse and the blouse is lined with finest of net fabric. You can rock this outfit with unbound hair or an elegant chignon. You will not need to accessorize heavily with this saree as it made for a simpler, yet alluring appeal. It is subtle enough that it will give a youthful appeal to anyone who wears it. This Elan saree is nostalgic of the pre-partition era, as indicated by the name Nefessa. This pink and purple color choice is something of a fairytale princess combination, yet adorned with cultural embroidery in fine details, it is the perfect outfit for any wedding function. We can all agree that Elan couture is always the very epitome of the elegance and grace, and this saree in Nafessa campaign is no different. This saree features a hand embroidered Chatta Patti blouse in silk. The saree is also made of deep magenta charmeuse silk, accentuated with Gota along the border. It is a feminine, colorful take on the season’s graphic detailing. 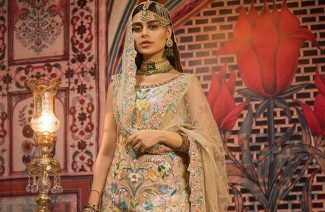 The hand embroidered dabka, sequins, crystals and beadwork makes it one exquisite piece. It’s the perfect traditional with a modern twist wedding outfit this year. Natasha Kamal is something of an authority on getting the feminine aspects of fashion right. Twist things up a little with this digitally printed, geometric saree by Nomi Ansari. It is crafted from pure silk with peals of bright shades in a custom kaleidoscope of colors. It comes with a hot pink inner and a heavily embroidered net pallu with multicolored embroidery. The delicate zardozi work refines the style of this saree to their best. The black blouse with multicolored embroidered flowers is the right amount of edgy to bring out your inner eccentricity. 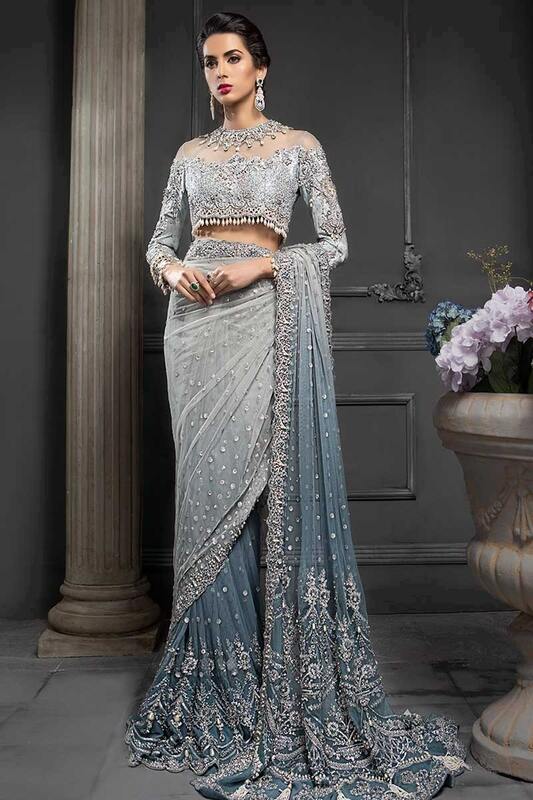 This Maria B formal, net saree is right out of a winter wonderland with its icy blue and gray accents. 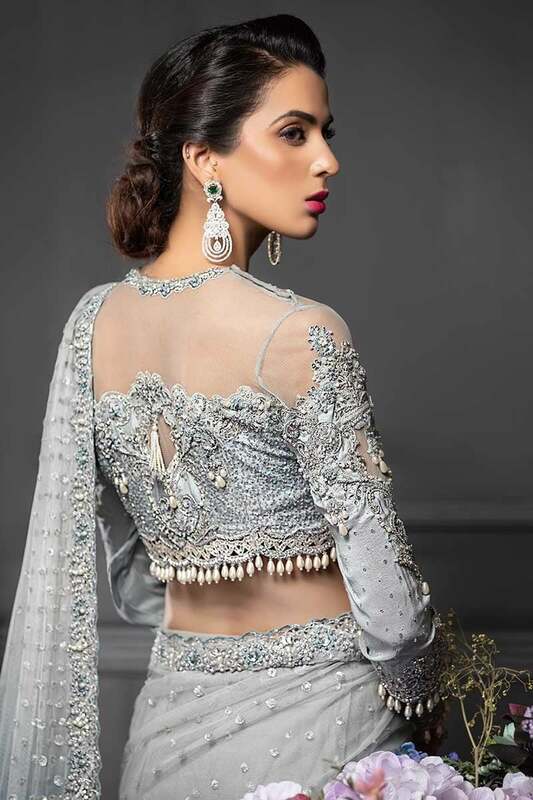 Frosted with beads and zardozi work, this should make it to your wedding trousseau. The style of the saree is regal in its timelessness. 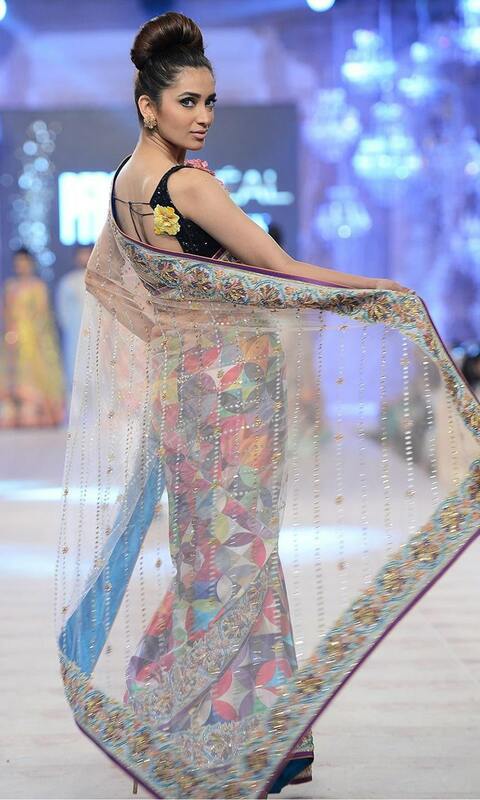 Let’s take a minute to appreciate this beautiful Nida Azwer’s formal saree. The embroidered sparrows and the pretty pastel shades are everything you need for your formal wardrobe. It’s subtle and romantic, and the feather detailing makes it perfect for all sorts of formal occasions, not just weddings. It is made with organza fabric, which is renowned for its translucent unique texture. Which saree caught your eye? Let us tell you that pastel sarees for summer weddings are the perfect option. Saree clad women with poise are always a class apart!